-incl. mountings and hoses for connection with blow-out-dryer order no. 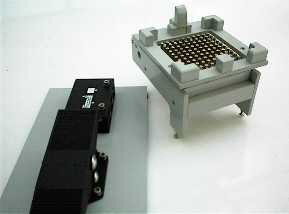 Like all MEKU ELISA devices, the Washing-head for microplates is solving a fundamental problem in daily laboritory work. After incubation of the test plate, a smooth and even washing process may be carried out by means of the special washing nozzles, which operate on the whole plate at once. The test plate is positioned on the washing head upside down, held by means of a guide on three of the nozzles, enshuring a stable position. The working principle eleminates suction of liquid, so no clogging of the nozzles may occur. 13 mm (½") hose. Prefiltering the water (0,5 mm) is necessary for reliable operation. In opposite to the washing head 4.0032 this machine has it's own wash-basin and water-outlet. 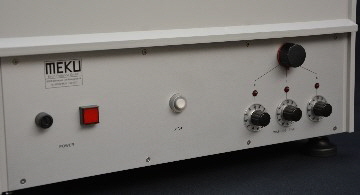 The washer is started with a foot switch, that is left activated as long as the washing cycle is intended. The washing machine may be delivered with an optional Blow-Out-Dryer. As additional equipment, we recommend using the MEKU Dosing Unit for adding the washing buffer. The device automatically proportions washing buffer out of a store tank and tap water. The controlling puls is generated by a special water meter and therefore is independant of the sort and count of washing machines used in the laboritory. Like all MEKU ELISA devices, the washing machine for microplates is solving a fundamental problem in daily laboratory work. After incubation of the test plate, a smooth and even washing process may be carried out by means of the special washing nozzles, which operate on the whole plate at once. During the washing process, two plates are positionend on the washing heads upside down, held by means of a guide on three of the nozzles, ensuring a stable position. The working principles eleminates suction of liquid, so no clogging of the nozzles may occur. The washer may be started with a key button on the front panel. Washing time is controlled automatically as preset before the washing process. The six head machine is able to process two, four or six plates, rinsing the plates in pairs one after the other. 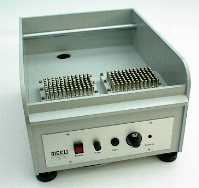 Thus, fast and continuous work is possible with drying the plates on the MEKU Blow-Out-Dryer (see options). Additionally we recommend using the MEKU Dosing Device for adding the washing buffer. The apparatus automatically proportions washing buffer out of a store tank and tap water. 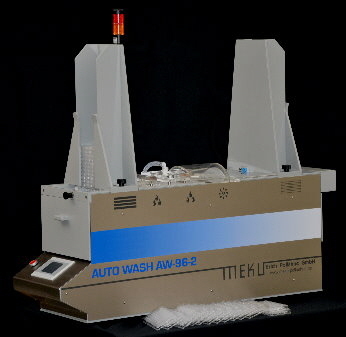 The AutoWash AW-96-2 is a completely automatic washing and drying plant for ’96 micro-titration plates. From a pile of test plates in the entrance feeder tower, the plates are laid individually on a transport runner by a plate lifter and carried to the next station by a conveyor under it. 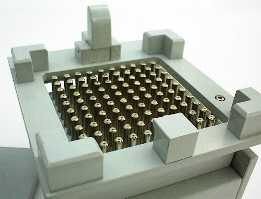 At this station, every individual optical cell of the test plate will be washed twice for variable seconds (0-4s adjustable) in each case from above for safety reasons. Subsequently, the test plates will reach a centrifuge, in which they will be dried. Finally, the plates are piled in an exit tower for removal. The AutoWash AW-96-2 monitors the most important functions completely automatically and, if there are changes to the normal conditions, it will show appropriate messages on a touch panel screen. At the same time, the apparatus distinguishes between status and error messages. These messages are supported optically by a signal light on the entrance feeder tower. Four different blinking or continuous light signals are used, so that it is possible to recognize from a distance what type of message it is. 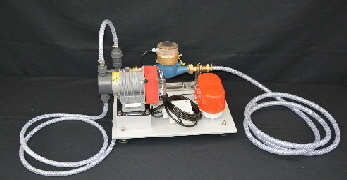 For safety reasons, the complete apparatus is operated with 24 VDC. The structure of this apparatus enables it to be easily dismantled into its individual components, to enable cleaning and maintenance tasks to be carried out as effectively as possible. A high-walled apportioned water trough ensures the optimal protection against sprayed water under the whole path of the plates. Unlike to the first version this second version of the AW-96 makes no noise during the lifting process, the centrifuge step-motor works without a mechanical brake and the plate conveyor is a stainless steel chain. 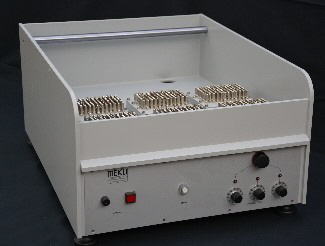 The MEKU Dosing-unit enables automatic and reliable dispensing of washing buffer during the washing cycle. The appliance is inserted on the water inlet side of the MEKU Washing-machine. A water meter is giving pulses every 0.25 l rate of flow to the dosing pump. This adds washing buffer at an injection point to the water flow. The dilutio n may be regulated at the pump according to the requirements. The buffer concentrate is kept in a store tank with stirrer for preventing cristallisation of the liquid. A red warning lamp on buffer low, simultaneously disabling the pump. 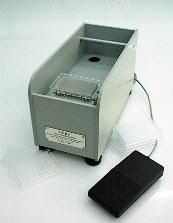 Praxis has shown how difficult and time consuming drying of microplates may be after the washing cycle. Even by knocking out the plate on a cloth, small water drops may rest on the cavity bottom. Drying is essential for getting a correct dilution. The Blow-out dryer may be easily mounted as a supplementary part of the washing machine (socket for external use available). The test plate is positioned topside down on to the blowing nozzles and latched by a locking bar. The blowing process is activated by means of a foot-switch. Drying time of 1 - 2 seconds is sufficient. Possible drops on the plate surface may be eliminated with an absorbent cloth. 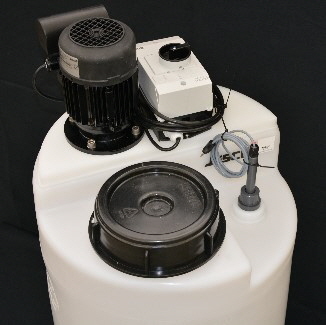 For continuous work, a compressor with an air throughput of 300 l/min and 50 l reservoir is necessary. If your vessel is smaller or the feeding line is longer than 10 m, then the Compressed-Air Reservoir (no. 4.0043) should be installed. 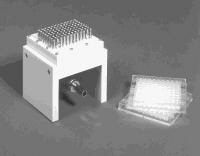 The Tube-Washing-Unit is used for rinsing tubes after being used. The unit has to be placed above a water drain using the supplied hose for connection to the water tap. After opening the water tap, the unit is ready for use, and the washing nozzles are closed. Set the tube upside down onto the washing nozzle and press down on the valve cone. This will open the valve and produce a water stream through the nozzle. The valve cone has multiple slots at the side, so water may flow off without pressure. For working as efficient as possible, two nozzles are provided. A second unit, connected to a compressed air line, may be used for drying the tubes after being washed. 2 m water connecting hose ½"
The Hand-Washing-Unit is used for rinsing microplates with tubes. The unit has to be placed above a water drain using the supplied hose for connection to the water tap. Now the unit is ready for use. The washing head is lifted from the guides on the ground plate and placed aside. After fixing the plate at the assigned place on the base plate, the washing head may be lowered above the tubes between the four guides. During the lowering, the water tap or alternatively the ball valve at the unit may be opened. The water flow will start at the ends of the pipetting tips at the bottom of the tubes and rise until it overflows the border of the tubes and end in the water drain.